The Vancouver Canucks lost more than a hockey game in Montreal on Thursday. The 2-0 loss to the Canadiens is of secondary concern to the Canucks and their fans, as Elias Pettersson left the game with what looked like a leg injury in the second period. Pettersson appeared to be in a great deal of pain, staying on the ice for about 45 seconds before skating off with his own power. Canucks head coach Travis Green didn’t have much to say about his condition, other than to characterize it as a “lower body” injury, adding that there was no timeline for his return. At 18 years old, Kotkaniemi is the youngest player in the league, and doesn’t have a reputation as a dirty player. 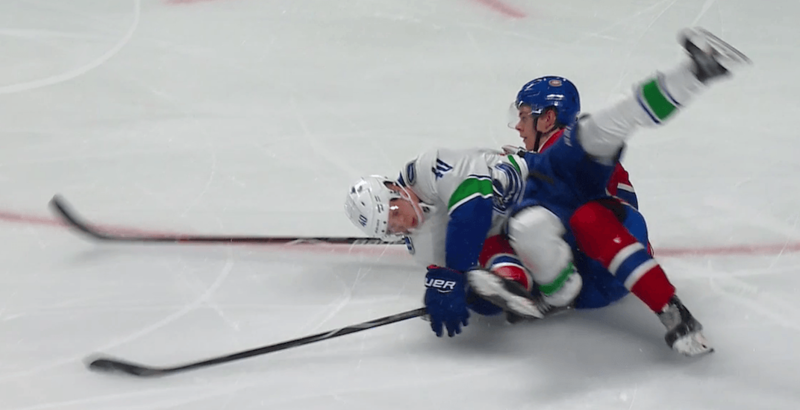 While he certainly deserved a penalty for hooking Pettersson initially, there didn’t appear to be any intent to injure. Saw Pettersson walk through the room. No crutches and not a noticeable limp. #canucks waiting on coach to talk. Pettersson will travel with the team to Toronto, where the Canucks will play the Maple Leafs on Saturday. He’ll almost certainly miss that game – the Canucks hope he won’t miss much more.